Voz is a worker-led organization that empowers diverse day laborers and immigrants to improve their working conditions and protect civil rights through leadership development, organizing, education, and economic opportunity. I sat down with Marvin Pena, Voz’s grassroots community organizer, in the MLK Worker Center. Q | Tell me about Voz in general terms for those that aren’t familiar? 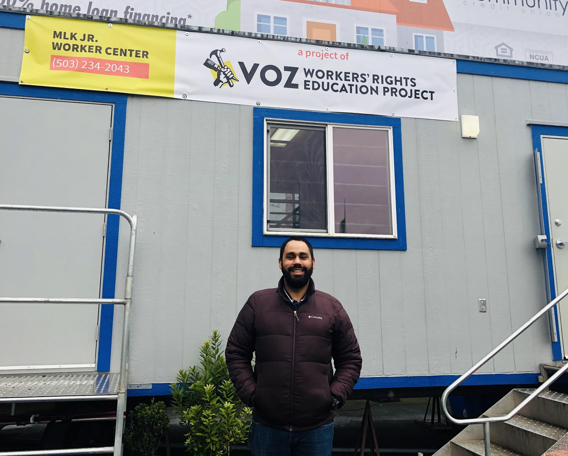 A | Voz is a worker-led organization that empowers diverse day laborers and immigrants to improve their working conditions and protect civil rights through leadership development, organizing, education, and economic opportunity. Q | What are examples of things labor workers can do for neighbors? A | Voz has workers with an array of skills to meet employers’ needs. Most of our workers have general labor skills, but you can always call in advance to hire a worker with a particular trait. We require a minimum of 4 hours per job. In case the job takes less than 4 hours, the workers need to be paid the 4 hours. The starting rate is $15. Q | For those new to Voz, there are two buildings. Can you explain the difference? A | Voz Workers’ Rights Education Project has two different addresses. The reason for this is that one address is for the admin office and the other address is for the Martin Luther King Jr. Worker Center. At the admin office, we have different departments like the Development and Fundraising, Internal and External Organizing, Bookkeeping and the Executive Director office. Here is where we develop programs and workshops like Know your Rights, Wage Theft, art classes, events and more. Q | How can you support Voz? First, you can hire a worker. By doing this you get some extra help to finish your projects, and at the same time, you are helping a worker who has limited access to resources and sources of income. Also, you are helping to build a more inclusive and compassionate city, because is not just hiring a worker, it is also understanding cultural and political challenges they face every day. Spreading the word about what we do and how helpful the service we provide is, and at the same time it’s helping an organization that advocates for workers and immigrants’ rights. Donations are always welcome and essential for the work we do. As a nonprofit, we don’t receive any commission or fee from the work the day laborers do. We function off donations and the support of the community is vital to keep us going. 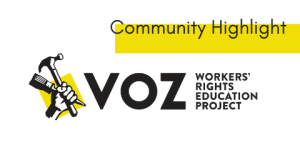 If you want to send us a donation you can mail it to 330 SE 11th Ave. Portland Oregon 97214 to “Voz Workers’ Rights Education Project.” You can also visit our website where there is a button for donations, but also you can click here (https://portlandvoz.salsalabs.org/draftofprimarydonationpagecopy1/index.html) and it will take you to the donation page. Becoming a Vozista. That means that you become a current donor and your contribution will be received from your bank every month. Even $10 make a big difference in the work we do. Supporting our events or advocacy efforts, participating in our community celebrations, showing up in our rallies, or signing petitions to help to generate political change. Q | As community members, can you volunteer? Time commitment: 2 hours, Flexible according to the volunteer’s schedule. Dispatch volunteer: Help laborers get to their job sites. Time commitment: Flexible and available one day between 7-10 or 11 am consistently either every Monday, Wednesday or Saturday. Database support for ID making at the Worker Center. Time commitment: Flexible according to the volunteer’s schedule. Support with Activities Coordinator on a weekly basis. First on Tuesday and/or Friday from 10 am -12 pm; then they can work on their own. Time commitment: Varies depending on what event. Time commitment: 1 ½ hour on one day a week from 11:30-1:00. Time commitment: 2 hours every 1st Saturday of every month from 8 am to 10 am. Various tasks to help. Workshops: Must be bilingual to interpret the conversations. Time commitment: 2 hours every 2nd, 3rd and 4th Friday every month from 9:30 am to 11:30 am. Q | Anything you’d like to add? A | I want to emphasize that we are more than a place to find labor. We want to dignify workers, protect them and offer resources to make sure they are not taken advantage of. We want to empower day laborers and give them the chance to decide what they do in their life.